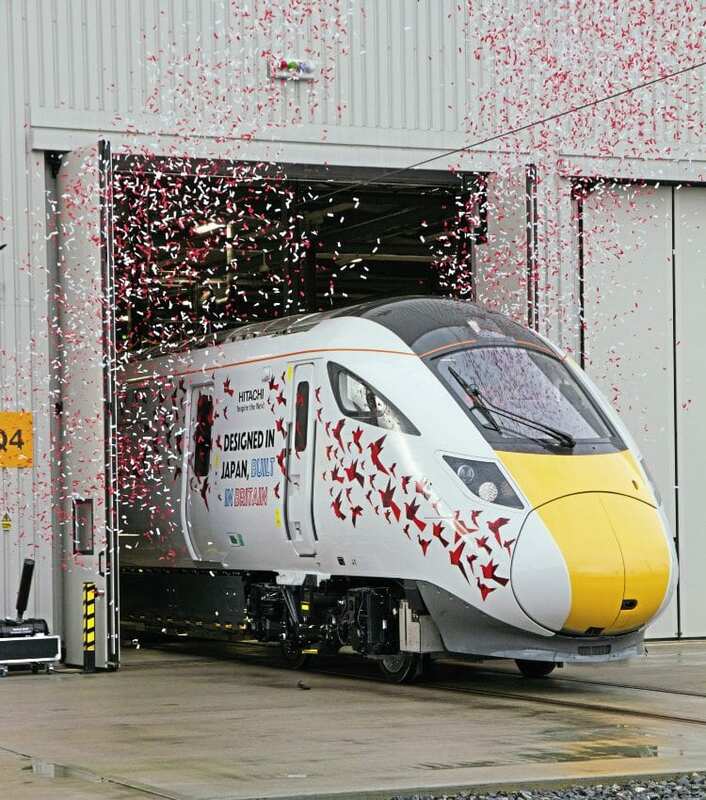 THE first UK-built five-car Class 800 IEP has rolled off the production line at Hitachi Rail Europe’s (HRE) new £82million train building factory at Newton Aycliffe. It is just 15 months since the then Prime Minister David Cameron formally opened the facility. Set No. 800005 emerged to a fanfare from the commissioning shed on December 9 before being inspected by guests at a ceremony attended by Secretary of State for Transport Chris Grayling and Japanese Ambassador to the UK Koji Tsuruoka. Alongside in the commissioning shed was set No. 800006, another Newton Aycliffe product. Hitachi’s 31.5 acre factory, which includes storage sidings and a test track, is situated close to where George Stephenson assembled Locomotion No. 1, the first locomotive to carry passengers on a public rail line. British-built first IEP was hailed by HRE managing director Karen Boswell as “a celebration of the return of train manufacturing” to the area.